Biobased, biocompostable and 100% recyclable to a virgin form — these are the main advantages of plastics made from polylactic acid (PLA). With long-term of experience in lactide purification and PLA polymerization, Sulzer delivers process know-how and key equipment for the production of PLA. Join us on the journey to a sustainable future. Everybody can make conscious choices to use sustainable products. Sustainable alternatives for plastics which do not degrade do exist. One is polylactic acid (PLA) — a thermoplastic polymer obtained by polymerization of lactic acid (LA). The process was patented as early as 1954, but it took almost 50 years for this plastic to be used in large quantities. Sulzer has made major contributions towards optimizing the PLA process for industrial use in the last 25 years. The resulting bioplastic features mechanical and thermal properties comparable or superior to its traditional oil-based counterparts, and offers a wide range of applications (Fig. 1). Thanks to its biocompatibility, it can safely be used also for medical purposes. PLA is used as raw material for 3D printing for home use due to its low melting point and flow properties. Fig. 1 Main PLA application areas. The lactic acid (LA) monomers are obtained via fermentation of glucose or sugars from crops such as corn, wheat, sugar cane, sugar beet and many others. Until now, these raw materials have been extracted mainly from sugar beet or corn or tapioca starch (Fig. 2). Fig. 2 PLA generation (e.g. from corn) and subsequent recycling process. The need for biobased, biocompostable, recyclable and non-hazardous plastic materials inspired researchers all over the world to find other renewable plastics. And they have been successful. They have produced a new generation of plastic that uses biorenewable material and, in the future, lignocellulosic sugars could be used. Lignocellulosic sugars are second-generation raw materials extracted from biomass such as straw, corn stover, sugar cane bagasse or wood chips (Fig. 2). KU Leuven’s Centre for Surface Chemistry and Catalysis, Belgium, even applied for a patent using the waste of cheese production to extract lactic acid. The broad range of feedstock suitable for the production of PLA allows process industries worldwide to use the plant-based resources in accordance with their local availability to produce the sugars. This possibility allows users to maximize the process’s cost-effectiveness, and the reliability of the supply chain while minimizing the carbon footprint for raw material transportation. For example, sugar cane and its bagasse can be chosen as the raw material for PLA production in equatorial regions, while straw, corn or wood chips can be the most suitable options in moderate temperature zones. The process of converting sugar into PLA plastic involves several steps (Fig. 3). First, sugar is fermented with robust and efficient non-genetically modified (GMO) strains to generate lactic acid (LA). Second, the LA is polymerized through a polycondensation reaction to a prepolymer with low molecular weight (Fig. 5). The polycondensation reactors, thanks to their flexible operating conditions, help to remove by-products and maximize the yield. The low molecular weight prepolymer is then converted, through a catalytic reaction, to lactide. The lactide is then purified with Sulzer distillation and crystallization equipment before being polymerized. After being fed to a series of loop and plug-flow reactors, the lactide is converted to PLA. Thanks to the proprietary devolatilization devices of Sulzer, the remaining volatile components are separated by degassing the PLA melt. Depending on the final product application, the last mixer is used to add color or additives to the melt. As the last step, PLA is converted into solid pellets in order to be transported or stored. Fig. 3 Process steps from raw material to PLA. With over 25 years of experience in lactic acid and lactide purification and polymerization, Sulzer and its partners can deliver single, key equipment solutions for PLA manufacturing. In addition, Sulzer designs and implements key equipment and integrated modular solutions (Fig. 4) for individual steps of the polymerization. Sulzer Chemtech also offers several additional services to ensure that customers in the agricultural, chemical and fiber sectors can continuously benefit from their integrated PLA technology. More precisely, installation supervisors and start-up engineers provide support in the assembly, installation, commissioning and start-up of the equipment. Additionally, the operation and maintenance training offered by Sulzer helps plant operators to thoroughly understand the system. Finally, to assist customers in maximizing the performance and service life of their equipment, the company also provides recommendations and guidelines on the best maintenance practices. Fig. 4 Skid mounted unit for PLA production. With the support of Sulzer, one of the world’s top two PLA manufacturers developed a large plant to produce 75’000 tons per year of PLA plastics, including heat-resistant PLA composites, for a wide range of applications. Specialized and highly qualified teams performed extensive laboratory and pilot testing and proposed a customized design that met the plant and manufacturing requirements. Thanks to the support provided by Sulzer Chemtech’s experts, the PLA manufacturer has been able to create one of the largest PLA plants in the world, and deliver high-quality bioplastic solutions for a greener future. One of the main benefits of the Sulzer technology is that with the same installation, the properties of the polymer can be adapted easily. There is no need for different process lines. With the Sulzer technology, the monomer ratio and the molecular weight of the PLA can be set precisely according to the requirements of the market applications. This flexibility of the process lines is important because the specific setting influences the speed of biodegradability of PLA-based products. The biodegradability is controlled by adjusting the relative amounts of D- and L-lactides. In fact, PLA polymers with high amounts of the D-configuration are easily biocompostable; PLA polymers with high amounts of L-lactides are not. As a result, PLA-based materials with higher amounts of D-lactides are suitable for disposable applications, e.g., food packaging with a short shelf life, whereas PLA-based materials with higher concentrations of L-lactides are required for more durable solutions, e.g., electronic components. Thanks to Sulzer’s smart measurement control and precise heat settings, the amount of L- and D-lactides in the PLA pellets can be easily adjusted. Some of the key equipment developed by Sulzer as part of its PLA production offering includes falling film crystallizers, the loop and plug-flow reactor (SMXTM), Sulzer Mixer Reactors (SMRTM) distillation and degassing technologies (Fig. 5). In addition, these solutions are fully scalable and ideal to accommodate variable production volumes, allowing manufacturers to expand their business up to 100’000 tons per year. Fig. 5 Key Sulzer equipment for PLA polymerization processing. The most important factor for good polymerization is that the process temperature is maintained at a controlled level and that the feed material is thoroughly mixed. This is more difficult in conventional polymerization, where the dimerization process and polymer reaction take place in a continuously stirred tank. Sulzer can offer special mixer reactors that combine these two processes: mixing and heating or cooling. These reactors have a smaller diameter than the tank and provide uniform temperature distribution. The tubes inside the mixer heat exchanger are filled with a transfer media, depending on the application, and allow a regular temperature transfer. The transfer tubes are shaped in a special form which ensures the material passing through the reactor is mixed (Fig. 6). Fig. 6 Heat transfer and mixing in one stage with SMR™ reactor. Because the mixer reactors are arranged in a loop, continuous material flow is possible, and uniform polymerization can be achieved. The process control can monitor the main process parameters to guarantee the polymer specifications. Sulzer’s devolatilization technology is used to strip the monomers from the PLA to achieve high quality of the material. Degassing occurs quickly; the material does not stay in the vessel for a long time. This is important because a long dwell time increases the yellowness of the material or degradation of the polymers. Click here to see a video about PLA application areas. PLA is a biobased, biocompostable, recyclable and non-hazardous plastic material, and can be produced from renewable sources. It can be used in many applications: thermoformed products, fibers and non-woven materials, films or molding. All these exceptional properties make PLA not only suitable for packaging, medical devices and implants, as well as electronic devices, but also for textiles, 3D printing processes and components for the automotive sector. Furthermore, the possibility to produce PLA composites, such as foamed PLA, further expands the range of applications for this bioplastic. 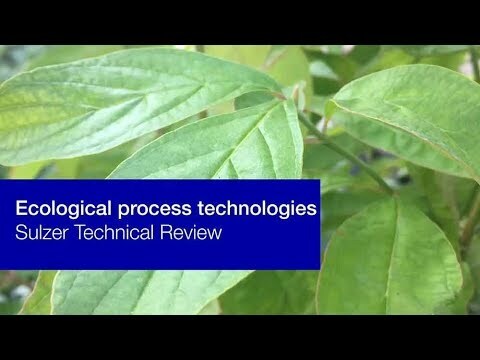 Sulzer is ready to support you to produce sustainable plastics from biobased materials.